I&M Bank Rwanda opened its doors for the first time in May 1963 as the first financial institution in Rwanda. Since that time, as the country and the needs of the market have changed, so has the business. The Bank now serves three key segments; Retail for Individuals, Corporate and Institutional Banking as well Business Banking. The Services offered range from Advisory, Business Facilities, Forex trading, Mortgage financing, Transfer and Remittances, Electronic Banking, Digital Payment solutions and so much more. 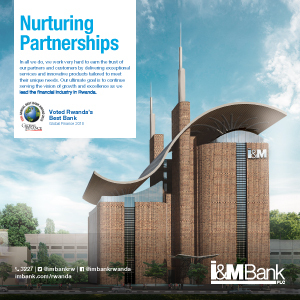 I&M Bank Rwanda is a leader in innovation and is the bank of choice for Coffee, Tea, Minerals, Power, Telecoms, Institutions, and Diplomatic representations in Rwanda. Extensive development work with Small and Medium Enterprises has been made possible through partnerships with Development Finance Institutions (DFIs) to offer quarterly Financial Literacy Workshops and lines of credit. Over the last five years, the Bank has leveraged on technology to introduce new products and services into the market including Transactional Banking Services, m-Visa payments, Visa cards (Credit, Debit and Prepaid), integrations with Mobile Network Operators to support Bank-to-Mobile wallet transactions, and e-Tax. We refined the organizational structure to drive a sales focus under the differentiated Business Units. These have supported customer relationship management both at individual account level to regional levels. The structure ensures that the sales units maintain linkages into the internal control functions such as Operations or Risk Management. In the Payments space, in 2014, we introduced VISA payments cards, which are accepted globally, this resulted in a 800% increase in number of card transactions in just 2 years. In the same year, we went on to roll out mVISA, a mobile payments solution that allowed for person-to-person, as well as bulk payments. As a business, we have been intentional in growing revenues and managing expenses which allowed us to maintain positive cost to income JAWS of 5% pa.
Investment in our ATM infrastructure over the last few years has resulted in best in class ATM uptime. Industry Recognition. Over the last 5 years, I&M Bank Rwanda has been the recipient of several awards including. Best Bank in Rwanda by Global Finance in 2017, Bank of the Year Rwanda by the Banker Magazine (2006, 2007 and 2013), Best Customer Service Bank Rwanda (2016) Bank of The Year from the Mining Industry in 2015 and numerous awards from Rwanda Revenue Authority for Tax Compliance. Our target over the next five years will be in improving our distribution channels to this end, key investment has been made towards a new core banking system and reporting tool that will result in operational efficiency and provide us with a mechanism for predicting and meeting customer needs. We shall continue to enhance our Digital Banking offerings and this will also usher in more products and allow for tailored solution for specific customer needs. In line with that, we are also launching Agency Banking as a solution for more financial inclusion across the country. Other key investments will include improving our Service provision; we have already introduced a complaints management system and are in an ongoing staff customer service training. We are also expanding our ATM network, and looking at changing how people transact through the introduction of smart branches in the next few years. At I&M Bank, customer feedback is a strong component in our product development process. Following customer insights from our last Account Opening Campaign, we were able to identify opportunities and as a result, this year, we launched three new Products; A young saver’s account for minor, a Malaika women’s account and a FuturePro account for students. Over and above that, we also adjusted some of our existing offering to allow more people to take up the products, which we believe is going to be key in supporting access to financial services in Rwanda.